A solid escape from the city and ultra-modern distractions, Kihei is also removed from the expenses and crowds in other parts of Maui. Kihei vacation rentals offer an even better option than a hotel or motel because you'll have the amenities comparable to living in one of the most beautiful beachfront destinations anywhere. Everywhere in Kihei is close to the beach, so conveniences mixes with the various other activities everyone can enjoy here as well. The picturesque views everywhere you look sooth the mind for as long as you stay. You'll see and feel right away why this island getaway is so desirable. When the family is situated at Kihei rentals, the convenience allows for a hassle free time and many benefits that hotel and motel rooms don't offer. There is a full kitchen for stocking food and cooking, so you can save even more money and keep your expenses well within budget. By the time you go out for a swim in the warm, serene Pacific, you'll already be relaxed. Family fun can also be had by surfing or just letting the waves refreshingly wash over you. Family activity at Kalama Beach Park consists of a playground for the children, as well as a skate park, basketball courts, and music. Make a lunch in Kihei Maui rentals kitchens and have a picnic in the park as well. You can expand the peaceful outdoor experienced by visiting Kelia Pond, a national Wildlife Conservation District. Rare birds live along the salt marsh for bird watchers to marvel at. Nearby, the family can embark on a boat ride out of Ma'alaea for fishing, whale watching, or snorkeling. These leisurely activities and pure fun will build lasting memories you'll talk about for years to come. While you can cook at Kihei condo rentals, there is a choice of restaurants in Kihei that range from fast food to the cuisines of Hawaii and the Pacific. The dining choices go from moderate to upscale, so you can take a pick of what everyone is in the mood for. Also near Kihei vacation rentals are many shopping establishments. Small to large shopping malls offer a multitude of stores and restaurants to choose from, so an outing can be activity filled until you get back to the nearby peaceful confines of Kihei rentals. 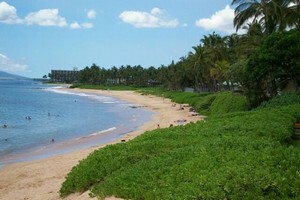 In fact, everything is close by, so the convenience will take all of the tensions away during your stay in Kihei. Set up your itinerary with an owner of Kihei condo rentals today and don't miss out on the unforgettable experience that can be had. This is not the average hotel or motel stay, so you can maximize the enjoyment of a magnificent vacation in Hawaii for the whole family. Choose from an array of options and you are sure to have a time that will let you forget about the hectic routines of home. Interested in More Kihei, Hawaii ? Check out nearby Haiku , Kaanapali , Kahana , Kapalua , Lahaina , Napili , Wailea .